Your highly specialized, full service medical staffing solution. MedicalSolutions excels at matching experienced medical personnel with high quality positions. We understand that medical professionals have many employment options in today’s medical field. We partner with each employee and assist them in finding the perfect work assignment - be it full-time or temporary. Whether your healthcare organization has fulltime or short-term staffing needs, MedicalSolutions can help. Our certified staffing supervisors are experts at finding the perfect employee - the first time. We specialize in placing highly trained professionals into positions with physician offices, medical billing companies, managed care organizations, and more. Our certified medical staffing supervisors work closely with new employees, ensuring we can offer an excellent match between employee and position. 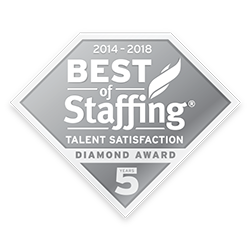 Medical Solutions has earned Inavero’s Best of Staffing® Diamond Award for providing superior service to job seekers for 5 or more consecutive years. Presented in partnership with CareerBuilder, Inavero’s Best of Staffing Talent winners have proven to be industry leaders in service quality based entirely on ratings provided by the permanent and temporary employees they’ve helped find jobs. On average, job seekers who work with winning agencies are 1.7 times more likely to be completely satisfied with the services provided compared to those placed by non-winning agencies. Less than 2% of all staffing agencies in the U.S. and Canada have earned the Best of Staffing Award for service excellence.